Ben Rounds – Ben Rounds ???? If you’re one of those for whom your favorite music is “anything but country,” you’ll want to skip this review for there is nothing in this 2014 eponymous release by Ben Rounds that is likely nor probably intended to win over converts. But if you’re one of those for whom today’s country music lacks the authenticity and the distinctness that you used to remember, there will be much for you to like here. Rounds plays all the instruments himself save for harmony vocals and some percussion. He produced it himself too, but this CD does not sound like something made on the cheap. Ben’s strengths lie in his sense of humor, evident throughout though never overreaching or attempting to stretch into the annoying territory of actively courting guffaws; and his vocals, which sound warm, just a hint of sandpaper, and the twang without which we might feel cheated. Clocking in at a neat 35 minutes, Ben Rounds doesn’t overstay its welcome, something that can’t be said for many albums today. Opener “Train Used to Run” is one of two highlights among the ten tracks. It might be because it’s an energetic chugger, exhibiting a hint of Credence Clearwater Revival, particularly in the guitar solo workout. “Here’s the Short List” takes a well-worn joke and freshens it in the context of offering advice to a younger chap on how to make a woman happy. The humor is a bit reminiscent of the type that Brad Paisley has built a reputation on. The vocal asides (“don’t do it” and “don’t get caught”), however, give the song its own unique whimsy in the tradition of all great country music. “Average Working Joe” uses an even sparer arrangement than the other tracks, slowing things down, and announcing Rounds as a populist without being overtly political. What would a country album be without a shout-out to Hank? And we get one on “Break Her Own Heart,” which marries a clever lyric to one of Round’s strongest melodies. The first half of the CD ends with “I’ll Be There Pretty Soon,” featuring a rock style guitar solo that fits neatly into a song that is otherwise pure country. And hey, what would a country album be without a shout-out to George Jones? Showing that he’s not afraid to change things up, “A Love That Strong” avoids traditional song structure by having a series of verses without a distinct chorus, similar in that regard to Dylan’s “Positively 4th Street.” The lead guitar accents the vocals satisfyingly well and the muscular solo begins and ends with a touch of the vocal melody line. “I Know I’ll Be Lonely” has flavors that may recall George Jones, Conway Twitty, and even Gram Parsons. Rounds doesn’t wear his influence on his sleeve and there is no attempt to ape anyone else’s style (a welcome relief from a lot of country “traditionalists”). Yet at the same time you can sense how immersed he is in his love of the masters of the genre. “My Dog Lil” is pretty much exactly what the title promises. And what would a country album be without . . . , well you know. The penultimate song, “Pickin’ On Her Heart” is the other highlight, boasting more smart wordplay. And if Rounds isn’t exactly John Prine in the lyric department (Hey, who is? ), he’s also no slouch in expressing himself in a way that skirts the clichés, which is always welcome in a world of “heart” always being rhymed with “from the start” and “love” with “heavens above.” The disc closes with “Stop, Drop, and Roll.” His exhortation to “pray” might lead you to think it’s a nod to modern country’s obsession with religious mentions, but disavow yourself of that notion. Nothing about Ben Rounds, the artist or the album, comes off as contrived. If you notice some similarity to “I’ve Been Everywhere,” you’re not alone. There’s something in both the rhythm and the melody that recall the tune famously sung by both Hank Snow and Johnny Cash. And when Rounds ends the song and the album abruptly on the word “Stop,” you can’t help but smile. There’s a folk music feel to a lot of the material (percussion is very low in the mix) in addition to the typically forgotten “western” part of country and western. The themes are consistent with C&W, including love and heartbreak as well as a tribute to his pup. Rounds also avoids the all too common tail-end (B-side in the vinyl era) lag. The songs are strong all the way through, with tempos varying enough to make you realize that some thought went into the sequencing. Ben Rounds is a welcome breath of fresh air in a country genre polluted with recycled hair metal, pop with a bit of banjo thrown in, and throwbacks who only make you want to go back and listen to the original artists. Country fans take note and don’t miss it because the loss will be yours. Absolutely NEED a Ben Rounds CD after reading this review? Looking for a great gift for yourself or a friend? Fill out the form below, and Ben will you about get one shipped to you ASAP. 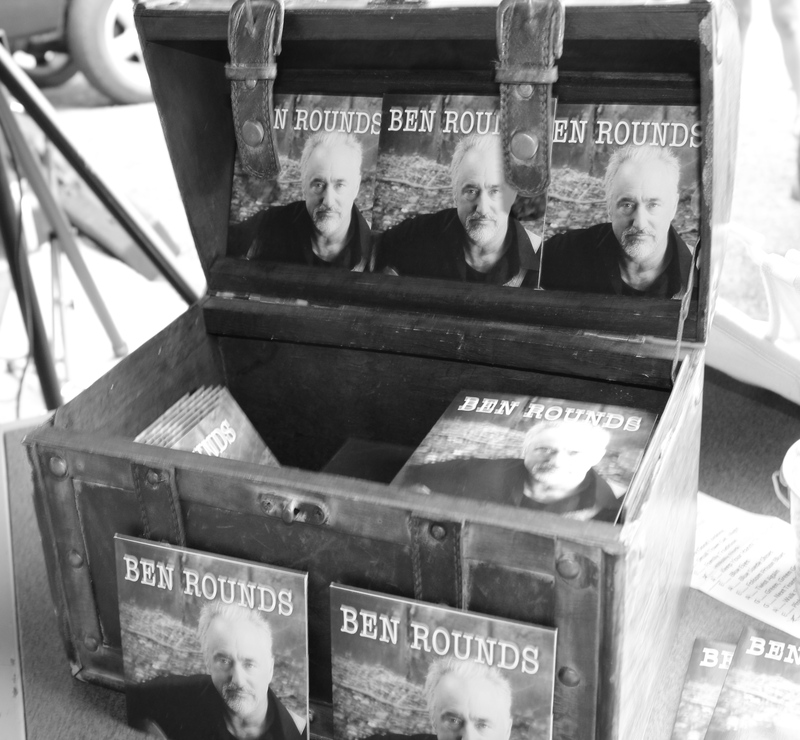 “Ben Rounds” is indeed an album to be treasured.